Cisco's April 2nd, 2014 announcement - Cisco and Industry Leaders Will Deliver Open, Multi-Vendor, Standards-Based Networks for Application Centric Infrastructure with OpFlex Protocol - has drawn mixed reviews from industry commentators. In, Cisco Submits Its (Very Different) SDN to IETF & OpenDaylight, SDNCentral editor Craig Matsumoto comments, "You know how, early on, people were all worried Cisco would 'take over' OpenDaylight? This is pretty much what they were talking about. It’s not a 'takeover,' literally, but OpFlex and the group policy concept steer OpenDaylight into a new direction that it otherwise wouldn’t have, one that Cisco happens to already have taken." 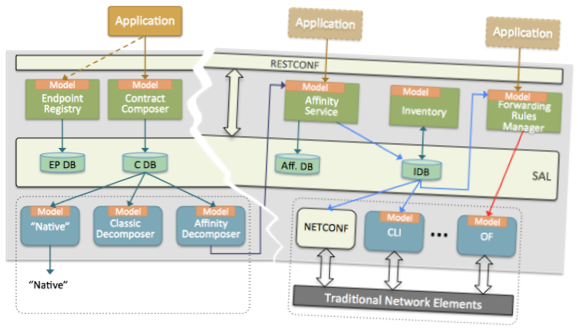 The diagram at the top of this article illustrates the architecture of Cisco's OpenDaylight proposal. The crack in the diagram was added to show the split between Cisco's proposed additions and existing OpenDaylight components. It is clear that Cisco has simply bolted a new controller to the side of the existing OpenDaylight controller, the ACI controller on the left has a native Southbound API (OpFlex) and treats the the existing OpenDaylight controller as a Southbound plug-in (the arrow that connects the Affinity Decomposer module to the existing Affinity Service module). The existing OpenDaylight controller is marginalized by relegating its role to managing Traditional Network Elements, implying that next generation SDN revolves around devices that support the OpFlex protocol exclusively. What is the function of Cisco's new controller? The press release states, ACI is the first data center and cloud solution to offer full visibility and integrated management of both physical and virtual networked IT resources, accelerating application deployment through a dynamic, application-aware network policy model. However, if you look a little deeper - Cisco Application Policy Infrastructure Controller Data Center Policy Model - the underlying architecture of ACI is based on promise theory. Promise theory underpins many data center orchestration tools, including: CFEngine, Puppet, Chef, Ansible, and Salt. These automation tools are an important part of the DevOps toolkit - providing a way to rapidly reconfigure resources and roll out new services. Does it make sense to create a new controller and protocol just to manage network equipment? The DevOps movement has revolutionized the data center by breaking down silos, merging application development and IT operations to increase the speed and agility of service creation and delivery. An alternative to creating a new, network only, orchestration system is to open up network equipment to the orchestration tools that DevOps teams already use. The article, Dell, Cumulus, Open Source, Open Standards, and Unified Management, discusses the trend toward open, Linux-based, switch platforms. An important benefit of this move to open networking platforms is that the same tools that are today used to manage Linux servers can also be used to manage the configuration of the network - for example, Cumulus Architecture currently lists Puppet, Chef and CFEngine as options for network automation. Eliminating the need to deploy and coordinate separate network and system orchestration tools significantly reduces operational complexity and increases agility; breaking down the network silo to facilitate the creation of a NetDevOps team. While it might be argued that Cisco's ACI/OpFlex is better at configuring network devices than existing DevOps tools, the fierce competition and rapid pace of innovation in the DevOps space is likely to outpace Cisco's efforts to standardize the OpFlex protocol in the IETF. Finally, it is not clear how serious Cisco is about its ACI architecture. Cisco Nexus 3000 series switches are based on standard merchant silicon hardware and support open, multi-vendor, standards and APIs, including: sFlow, OpenFlow, Linux Containers, XML, JSON, Puppet, Chef, Python, and OpenStack. Nexus 9000 series switches, the focus of Cisco's ACI strategy, include custom Cisco hardware to support ACI but also contain merchant silicon, allowing the switches to be run in either ACI or NX-OS mode. The value of open platforms is compelling and I expect Cisco's customers will favor NX-OS mode on the Nexus 9000 series and push Cisco to provide feature parity with the Nexus 3000 series.